A question we hear a lot about our green facades in relation to how to choose climbers for a vertical garden wall is how long will it take for them to grow? At Tensile, our approach is there is no magic wand we can wave for green façade growth rates other than to offer our understanding of what’s involved and how to make it happen. In our experience, when looking at climbers for your green facades, they will generally grow up to four metres during a typical Australia summer. But of course there are some important considerations to be aware of before this becomes a reality. 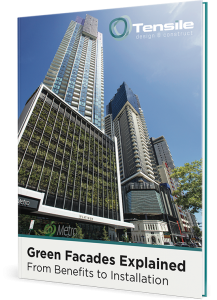 An exploration of green façade growth rates needs to have these elements: maintenance, access to good natural light, water and growing media volume. Let’s look at these in more detail. With maintenance, you need to firstly work out how it will be looked after and what the access is. Your green façade’s growth rate will be under threat if it is not properly looked after. A major factor in this assessment are the heights involved and incorporating that early in the design feasibility study so that the need for incessant revision is not encouraged. Integration is paramount to any facade Tensile designs. Most of us don’t think too much about how much light there is in urban areas but there is more than you might image. It isn’t always direct sunlight but there can be an abundance of refracted light which works well. You don’t want lots of shadowy light, though. Consider the expected coverage per plant and factor in what we call growing media volume, rather than focusing on soil. The amount of media will depend upon the desired outcome that is the expected coverage per plant. Plan for a climber to cover 12-18m2 with around 150 litres per metre of planter. How will water be a part of your green façade? You need to factor in an automatic system but evaluate access and any obstacles to that as well as how the system will operate and be monitored. Will sensors be a part of this? To sum up, our expertise in this area means we can offer an overview of what’s involved, including most importantly, the sorts of products you will need for your project. Our Green Solutions catalogue offers advice on plant selection, a range for all trellis applications from home to large commercial projects, design advice on trellis planning and DIY options. To find out more about green façade growth rates and products to facilitate that process go to the product page here on Green Solutions.